1970-73 Camaro Header panel hardware kit. Used to install the header panel in front of the hood and above the grille. Contains 13-pieces. Replacement headlight ajustment kit for all 1978-81 Camaro models. Complete 10-piece kit with all push-in nuts, screws and correct springs for both right and left sides. Replacement headlight ajustment kit for all 1970-73 Camaro models. This 10-piece set includes adjusters and springs for both right and left sides. Reproduction of the original 1970-81 Camaro hood hinge bolts. Kit includes 8 pieces. Correct #8-1/2" black oxide screws to install the roof rail molding track on all.This kit includes 36 piece to do both rails. Nice reproduction of the original bolts and fasteners used to hold the front sheet metal on your 1970-81 Camaro. 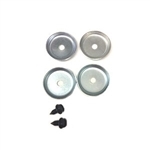 This 139 piece kit contains; Hood Latch Brace Bolts, Headlight Bracket Bolts, Hood Latch Brace Bolts, Fender Brace Bolts, Fender To Core Support Bolts, Header Panel End Bolts, Nuts and Washers, Upper And Lower Fender Bolt, Cup Washers And Bolts For Upper Inner Fenderwells, Hood Hinge Bolts, Fender Shims, Inner Fenderwell J-nuts And Bolts and Headlight Bezel Screws.